Bill commented that he was taking a lot more photos of Claudia and I goofing off on this trip, and I think he was right. I think that the three of us were a lot sillier. Not sure why, not sure it matters. One of the ways we goofed off was with my flip video camera. Last year, I had so much fun shooting little videos with our kodak camera, except that I had a great propensity to crash the camera. For Christmas, Bill bought me a flip recorder and I love it. I made videos on all of our hikes which start “Hi, this is Margaret Napier, amateur hiker.” Or sometimes it was novice hiker. Or amateur novice hiker. I couldn’t really decide on a title. Check them out in HD, if you can. And the ones where Bill held the camera turned out better than the ones where I held the camera. I didn’t post the one where I was basically shooting my right eye because I had accidentally hit the zoom. There’s also a video of one of the fire fighting helicopters filling up its water tank. This one is a about 2 minutes, 20 seconds. We had tons of fun on our trip. I’m proud of all the hiking I did. And a little less proud of my videos, but it was all about having a good time. Vacation was fantastic. Every year, we take a hiking trip with our good friend, Claudia. She is my unofficially adopted Bolivian sister. A few people have thought it a little strange that our single friend would enjoy hanging out with two smug marrieds for over a week, but it�? ?s worked out well for us. She and Bill get along, she and I get along, Bill and I usually get along. My biggest anxiety over traveling with her is that she is very fit and healthy, and I am not as much so. It leads me to worrying that I am holding her back on the hiking, but I think that�? ?s just my issue. Claudia kindly agreed to fly out to California from DC and spend a week at Yosemite. With my being out of work, it was great for us to be able to not have to spend money on airfare. We all saved money on not having to get a rental car and Bill and I agreed to cover all the gas and hiking beverages, snacks, and supplies. It balanced out, I think. Claudia flew in on Thursday and we hung out. On Friday, we went to the big sale at Joann. Claudia is a great sewist and it was very fun to have a friend to fabric shop with. We saved so much money! Between the two of us, we spend $130 and saved $150 (roughly). The big savings came from patterns. We got 5 patterns for $5, and they normall cost about $15 apiece. They also had thread at 50% off, and a lot of fabrics at 50% off too. We didn�? ?t pay full price for anything. We were having so much fun we lost track of time and almost missed out on lunch at Google. We made lunch just in time, and it was delicious (pizza, brisket and mac and cheese and a banana cream dessert). Bill gave us a tour of the campus. We even took two bikes for a spin to get back to our car. On Saturday we left for Yosemite. We stayed in Lee Vining for 3 nights, a town on the east side of the park. Sunday was our first day of hiking and it rained. The rain did not stop us though we weren�? ?t thrilled about it. We hiked to Devil�? ?s Postpile (a national monument) and to Rainbow Falls (which I have dubbed NonRainbow Falls since there wasn�? ?t a rainbow in the rain). This area used to be part of Yosemite, but isn�? ?t anymore. Devil�? ?s Postpile was really cool, especially from the top where they were almost perfect hexagons. I hadn�? ?t seen anything like it. The weather did clear up in the afternoon and it ended up being a nice day. We stopped for dinner and then went to see the Tufas (mineral formations in Mono Lake). We saw then at sunset and it was beautiful. I was obsessed with the angry clouds hanging over the mountain. We hiked 6 miles in total. Monday was our first day in Yosemite. Our plan was to hike North Dome. We hiked about .73 miles trying to find the trailhead and ended up getting in the car and driving to a different spot where we picked up the trail right way. I noticed that we were heading downhill at the beginning of the hike and knew that was going to be extra tough on the way back. It was a beautiful hike, and we had the trail to ourselves for the most part. We got to the point we thought was North Dome and Claudia had taken off her backpack thinking it was time for lunch and then we saw we still had a half mile to go. It actually turned out to be a mile and was downhill. It took us about 40 minutes but was worth it. The view was spectacular. We sat and ate lunch. Took lots and lots of pictures. Rested. And then headed back. It was tough going. The very beginning was uphill and then was downhill for a good part until the final .7 miles which was uphill and very tough. The hike to North Dome was about 10.4 miles total, plus the .73 miles we spent looking for the trail. It was a long day on the legs and we were exhausted. That is the longest hike I�? ?ve ever done. Tuesday we checked out of our hotel to hike and then drive to the west side of the park where we would be spending our last three days. We did one more hike on the east side, Lembert Dome and Dog Lake. Once again, we thought that we had made it to the top of Lembert Dome only to find we still had another .5 miles, this time uphill. Steeply uphill. More like light rock climbing than hiking. I was determined to make it to the top though. I told Claudia that the last bit was hard for me on so many levels �?? mentally, physically, emotionally. My fear of heights wasn�? ?t too bad because it was wide, but I was afraid of falling backwards and rolling off the dome. There was one part that I almost couldn�? ?t do, but somehow I found the strength, got a handhold and made it. Claudia offered me her hand but I was afraid of pulling her off her perch and seeing her roll off the dome. Rolling off the dome was a BIG concern for me. But I made it. Bill�? ?s vertigo kicked in and he stayed back from the final climb. After Lembert Dome, we hiked to Dog Lake. It was beautiful and we found a spot to have lunch and rest. Claudia and I put our feet in the water (brrrrrr�?�). It was pretty much all downhill on the way back and a pleasant day in all. This hike was a total of 6.6 miles. 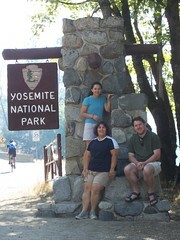 Wednesday we spent our first day in Yosemite Valley. There were definitely more people and it was a little more crowded, but not too bad. We decided to do a strenuous hike of 7.4 miles and an elevation change of 2700 feet. We figured that we wouldn�? ?t have a problem after all the other hiking we had done, and that it would be similar to a hike we did at the Grand Canyon. Ha! We definitely started strong, but it was truly a strenuous hike. It took us over 3 hours to get about 2.5 miles and 1900 feet up and I decided that I had gone far enough. I could tell I was getting tired as I made quite a few questionable foot placements and started thinking how easy it would be to break an ankle. I offered to wait for Claudia and Bill to make it to the top and back but they had enough too. We were at the perfect spot for lunch and a little rest and lots of pictures. While we were on our way up, we heard what sounded like thunder, or a low flying jet, and then a minute later saw a huge plume of dust. We figured it was a rock slide and it was as we saw on the news. Our trip downhill was very challenging. It was very rocky and required our full attention. We met up with some people with 1.2 miles left and they told us to be careful of a bear in the trail. We didn�? ?t see the bear, which was a good thing though we were a little disappointed. It was an exhausting day, having hiked a total of 5 miles. On the way out of the park, we saw a little light on El Capitan. It was people climbing El Cap. At night. In the dark. It was crazy. I wonder if it is less forboding at night when you can�? ?t see how high up you are. Or how far down it is. A few miles and minutes later, we saw the fire. It was mesmerizing in the dark. The sky was orange and pink, and then we saw the flames. It would have been beautiful if we hadn�? ?t known the devastation it was leaving. Last year, at Yellowstone, we saw an area that had been burned 30 years earlier, and it was still very obvious that there had been a forest fire. Even after 30 years. Thursday we were heading into the park from El Portal when we came across a fire helicopter that was hovering and filling up its water tank. It was cool, but again sad because we knew what it meant. Our highlight of the day was the bear we saw! He was about 100 feet from the road, taking a walk in the woods. He looked young, maybe 1 or 2 years old. Not a cub, but not full sized. Unfortunately we didn�? ?t get a good picture, but I have a picture in my head. We went to Wawona in the southern part of the park. 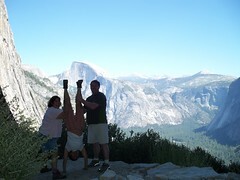 We stopped at Glacier Point and had a great view of the valley. It filled up with smoke, but then cleared up 45 minutes later. While hiking, we did see two fighter jets in the sky, probably on maneuvers. Bill wondered if they were checking on the fire while they were out. We also saw other smaller airplanes dropping water and flame retardant on the fire. I think we spent more time watching fire related activities than we did hiking, but it was hard not to watch. We did a hike to Taft Point which triggered my vertigo. My stomach did somersaults the entire time we were up there. There were also these fissures, little cracks that had gotten really big and I couldn�? ?t look at them. We did see a chipmunk who showed us his belly. I love the bellies. Before we headed back to the hotel, we stopped in Yosemite Valley to check out the Visitor Center, and we saw two fawns and a momma deer. I love the babies!! We hiked 3 miles in total. Friday was our last day. We woke up to find ask on the car, and it was pretty smokey. The fire was about 2 miles east of us. We checked out of the hotel and drove into the park, again heading for Wawona. We stopped at a little Market and Gas Station where 9 fire fighting vehicles were stopped. Most of them were coming down from having fought the fire all night. Two were stationed there as backup. That team was from Los Banos and had gotten the call at 10pm, making it to El Portal by 3am. The helicopter was making faster rounds; it filled up 6 times while we were sitting having our bagels for breakfast. They were definitely trying to hit the fire hard. We did a short hike to Bridalveil Fall. It was very pretty and there were lots of people so we didn�? ?t stay long. Then we got in the car and drove down to Mariposa Grove to see some Giant Sequoias. To say they were huge is an understatement. It was really amazing. They have bark that is 1 to 2 feet thick. I was a little disappointed that you couldn�? ?t get close to them, but apparently they have fragile root systems. I do want them to be around for others to see so I got over my disappointment. And after that we got in the car and headed home. We ended up hiking about 3 miles in total. So that was vacation, the great. We hiked almost 29 miles in the first 4 days, and then only 6 in the last two. A little unbalanced, but our feet were tired, and the smoke was bothering my asthma. We saw what we wanted to see, and left some things to see for future visits. It was really, really beautiful. Tomorrow I will cover vacation, the weird. On Thursday, we woke up and got in the car and did our last hike at Bryce Canyon. It was a short, one mile round trip hike to Mossy Cave and a small waterfall. Mossy Cave was interesting. The cave was quite cool and there were huge icicles. There are icicles in the cave for 10 out of 12 months. The weird thing about the icicles is that they appeared to be attached to the ground instead of the ceiling of the cave. After pondering this natural phenomenon, we walked over the the waterfall which was more of a trickle due to less than average snowfall during the winter. It was a quick excursion, but a pleasant way to start the day. We climbed into the car for our 2.5 hour drive to Zion National Park, the fifth most visited national park. We didn’t know this until we got there. It was a park I added on since it was “in the neighborhood.” Zion was a different experience; mountain hiking versus canyon hiking. We arrived at Zion in the early afternoon and headed straight for the visitor’s center. Let’s just say that the visitor center is nowhere near the east entrance of the park. You enter the park, go through a short tunnel, and then go through another mile long tunnel. This is the darkest tunnel I have ever been in. Built in 1930, there are no lights in the tunnel. There are a couple of “windows”, but it is dark. Also, traffic occasionally gets held up because the tunnel is narrow. Traffic has to be stopped to let oversized vehicles (RVs) through. Then you drive down the mountain, switchback city. It is very nervewrecking. Poor Bill had to do this drive five times, including once at night. But as passengers, Claudia and I enjoyed the view. Our plan for the afternoon was to hike the Emerald Pools Trail. It was a nice, moderate hike. We ended up going twice the distance we planned due to our excitement and going out of the order we mapped. But it was a nice day and we didn’t mind the extra activity. We ate dinner in Springdale, the town right outside of the south entrance (very cute town). The park and town have a great shuttle system from town to the park, and you have to shuttle most places in the park. Friday was the day of our big hike. We were on the trail by 10am and the plan was to hike up to Angels Landing. Well, from the start I did not have it. I hadn’t had as hearty a breakfast as I had before other hikes and I was feeling every ounce of water I carried in my pack. I off-loaded a bottle of water to Bill, took a goo pack, and ate some trail mix. After a short break, I gave it another go. Those three things worked a miracle and the hike turned enjoyable. It was beautiful. Refridgerator Canyon was gorgeous. And then we hit Walter’s Wiggles, a series of about 10 switchbacks. They weren’t as bad as they looked, or maybe it was the we stopped frequently for pictures. At the top of the wiggles was Scouts Lookout and we took a snack break. The plan was to continue on another half mile to Angels Landing. I should have taken the hint when the sign up for Angels Landing said “Strenuous hike. Do not attempt if you have a fear of heights or if it is wet or dark.” I have a fear of heights but it had really not been a problem. Well, they were right about the fear of heights on this trail. This part of the trail was insane. I felt like I was walking on the side of the mountain, which I actually was. There were chains so you could have a hand hold, but it was precarious. There was a point at the end of one section where it took all my upper body strength to get across and that scared me. I made it to a “landing” and thought I was at the top, but then I looked ahead and saw the rest of the trail. I told Bill and Claudia I wasn’t going another step further and to have fun. The rest of the hike took them about an hour roundtrip. I was ready to get off the mountain by the time they got back. After waiting an hour, I had worked up a good amount of fear for my short trip back to Scouts Lookout. When I made it back, I burst into tears. I was so unbelievably relieved to have made it back alive. I don’t think I’ve ever been that scared. Once I calmed down, the rest of the hike was wonderful. More pictures can be viewed at our gallery. Overall, it was a fantastic trip. I did things I had never done, I pushed myself physically and mentally, and I addressed some fears (though I can’t say I conquered them). I saw really beautiful things and I made great memories with my husband and friend. In looking back at the whole trip, the only things that I could have improved upon were to have had more time and to have stayed in Springdale. This was a really great vacation. Did you even notice I was gone, because I know I’ve been quiet in March? But for the last 11 days I was on vacation, and then recovering from vacation. My husband, friend and I went on a whirlwind tour of Las Vegas, Grand Canyon, Bryce Canyon and Zion National Parks. What an amazing trip! Vegas was fun, fun, fun. We had two full days in Vegas - Friday and Saturday. The Cubs were in town so we saw their last spring training game. We saw Legends In Concert, a great celebrity impersonator show. And the rest of our time was spent on a wildlife tour: big cats and dolphins at the Mirage, butterflies at the Bellagio, flamingos and turtles at the Flamingo, lion cubs at the MGM Grand, and sharks, fishes, and other sea creatures at Mandalay Bay. This was a kid-friendly activity for those of you with little ones. And of course we gambled a little bit. On Sunday we left early for the Grand Canyon. Wow. It is huge. I knew it was huge from flying over it, but when you actually stand there you feel pretty insignificant. Amazing. We hiked part of the Rim Trail after we arrived on Sunday, and then hung around to see the sunset. On Monday morning, we woke up to see the canyon at sunrise. The change in colors of the canyon and the sky were fantastic. After a hearty breakfast, we hiked the Bright Angel Trail down to 3 Mile Resthouse, a descent of approximately 2000 feet over 3 miles. And then we hiked up. It was tough. I did pretty well up to 1.5 Mile Resthouse. From about mile 1.5 to .5 I think I stopped at every switchback. Finally I turned a corner and could see the lodge and I knew I would make it and I did the last half mile without stopping. That might have also been about the time my goo pack kicked in. But I did it, in 5 hours and 52 minutes (including breaks), and it was a feeling of accomplishment. We rested for a little bit and got up to take a ranger led walk to view the canyon by the light of a full moon. Tuesday we stopped to see the Watchtower and then started our drive to Bryce Canyon. Bryce Canyon was spectacular. Completely different from the Grand Canyon. We saw Bryce at sunset (Tuesday night), by the light of the full moon (Tuesday night, after we did laundry), and sunrise (Wednesday morning). If we hadn’t seen the sign for the full moon walk at the Grand Canyon, we never would have thought to take in the view at either park, and was it something to see. I was surprised by how much I could see, and it was like having the park to ourselves. At Bryce, we really did have things to ourselves since we did the walk on our own, without a ranger, and I was very relieved we made it back to the car without having met up with a mountain lion. After sunrise, we decided to take a spontaneous hike on the Rim Trail from Inspiration Point to Bryce Point. Not the brighest move since we hadn’t eaten breakfast (or anything, for that matter) and we left our packs (with water and food) in the car. After our 3.2 mile excursion (1.5 hours), we ate a hearty breakfast and prepared ourselves for our planned hike of the Navajo Trail to the Queens Garden Trail to the Rim Trail. Good thing we read our tour book because we knew to descend the steeper Navajo Trail and come back on the easier Queens Garden Trail. Going down the switchbacks on the Navajo Trail, we were happy to know we didn’t have to dread them on the way back. A portion of the Navajo Trail was closed due to a rock slide and we broke about seven different regulations to hike and see it. Obviously we don’t recommend doing this, but the pictures do not do it justice. The “rocks” were at least six feet tall and six feet wide. It was nature having her way, but a shame because it blocked a very cool part of the trail. We doubled back and caught the Queens Garden Trail. Overall, it was a wonderful hike, actually walking among the hoodoos. The trip back up to the rim was a comfortably challenging hike. The total excursion took us a little less than 3 hours, including breaks. This brings us to Thursday, which I will continue with in my next post.